Last years introduction of the Blackfins had us all very excited. Were you excited too? They looked so suave, and there were new features like the carbon rails that we hadn’t seen before. So, what about the 2019 models? How have they gone improving? Well luckily, they’ve gone great! I still love them. There are some changes but all for the better. They have improved the materials, making it a touch lighter, added an action mount, changed up the fins and tweaked the design. But, that’s only some of it, read on below to find out the full details. Shaped much like a touring board but set much wider, this is a big board! Not as big as its brother the XL but still noticeably chunkier than other boards its length. So, 2018 when I first came across these boards I thought they might be slow and drag in the water. I was extremely pleased when I was proved wrong. One of the reasons into thinking it may be slow was because of its weight. With the new 2019 model, they have shed a bit of weight (I’ll explain how in materials) which led me to think I may notice a difference in speed. While I did notice it when carrying the board and moving it around, I can’t say I noticed a dramatic difference on the water. Where I did feel a slight change was the tracking. Because now you can remove the side fins, you can just use the center fin by itself. Which does make your turns a little trickier but it improves tracking and glide. In a roundabout way, tracking does help improve speed too, once you get a good paddle rhythm going, if you are heading straight and gliding well, you’ll start to go faster. One massive part of the performance here is stability! These boards are incredibly stable and can take a large amount of weight (450 lbs). These factors make the Model X a great choice for beginners, families (also handles on the nose for kids to hang onto) and people looking to do SUP fitness, or fishing, etc. As far as location and versatility, these boards are limited. They aren’t the kind of SUPs I would be taking out in the surf or in challenging waters. While they turn really well for their size, you’d be better off with something more nimble. Like the iRocker All-Around or even better again, ERS Skylake/RPC Ride. 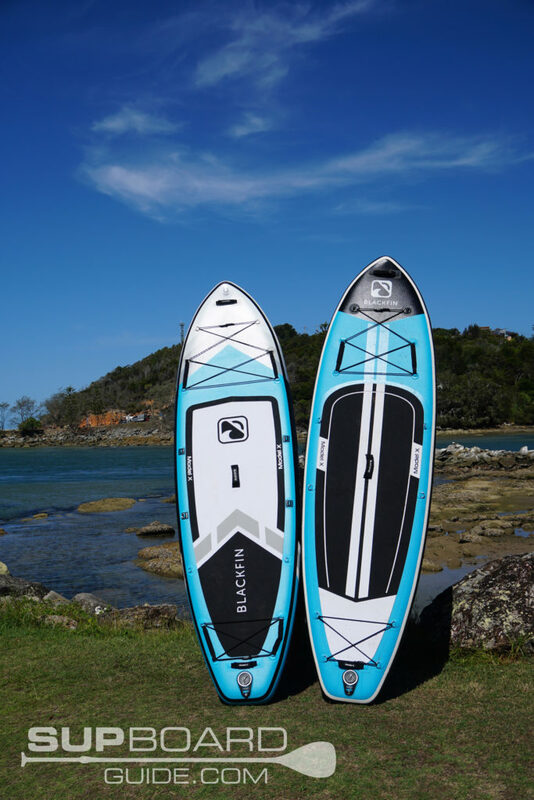 The Blackfin X is best suited to flat water conditions and perfect for long days out when you’d be taking extra gear. Not only will you be able to fit on board easily, but the deck pad is also super comfy! For those wanting something a bit more sporty and zippy but still like the idea of a high weight capacity then you should be looking at the new Model V, it’s a pretty spectacular piece of equipment! Let’s start from the start. Which in this case is the middle! The inner core of the Model X is two layers of PVC drop stitched together, that is then encased with more PVC layers. Previously, iRocker used quad layer PVC on the Blackfins. However, using a new tougher composite PVC this year they have been able to shed a layer of PVC but keep the same rigidness. The result is a 4lb drop in weight! To keep things super tight and strong, they’ve run a carbon fiber rail down the board too. While it adds a little weight to the board, you’ll forgive it for the extra stiffness it also provides. This carbon rail plays a big part in the board being able to hold so much weight. On top of all of that is the deck pad. Your deck pad is made from a thick EVA foam and features the blackfin logo imprinted, providing superb traction and comfort. Starting at the tail you’ll see there’s now some rear handles, an upgrade from the 2018 model. It assists in handling the board as well as the previous handle on the nose and of course the center carry handle. Now as another handle addition you’ll notice that the bungees up front and behind both have handles on them. It does assists with moving the board around but is also a fantastic safety feature for if you’ve got kids on board. All the handles do come off too if they get in the way of using the bungee as storage. Another new feature is the extra D-rings towards the back of the board. Which makes a total of 18 D rings, one up the front for towing and mooring, one at the bottom for your leash and the rest for storage &/or a kayak seat. 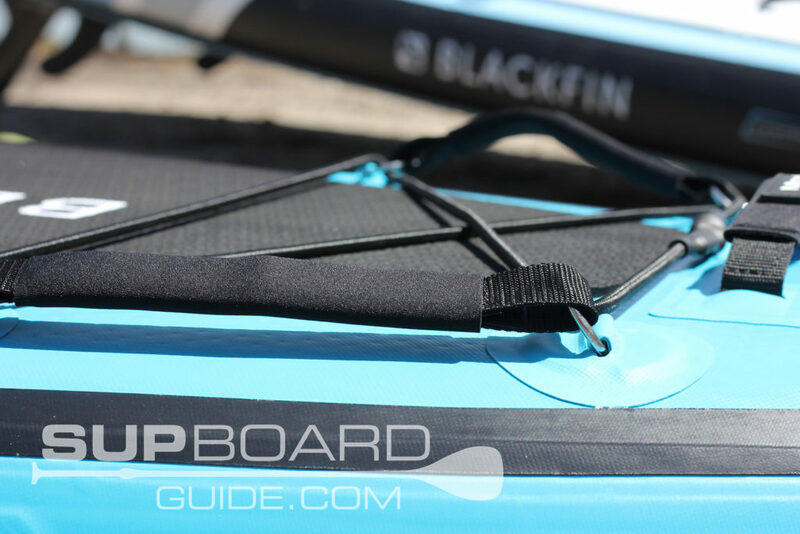 With the additional D-rings towards the back of the board, it opens up the possibility of two people kayaking the Blackfin. However, I would only suggest that for small riders on the Model X, much better suited for the XL. Otherwise, you can go gear crazy, especially ideal considering the huge weight capacity the Model X has. Attach a cooler bag, or 3! Up the front as another 2019 upgrade is the action mount. 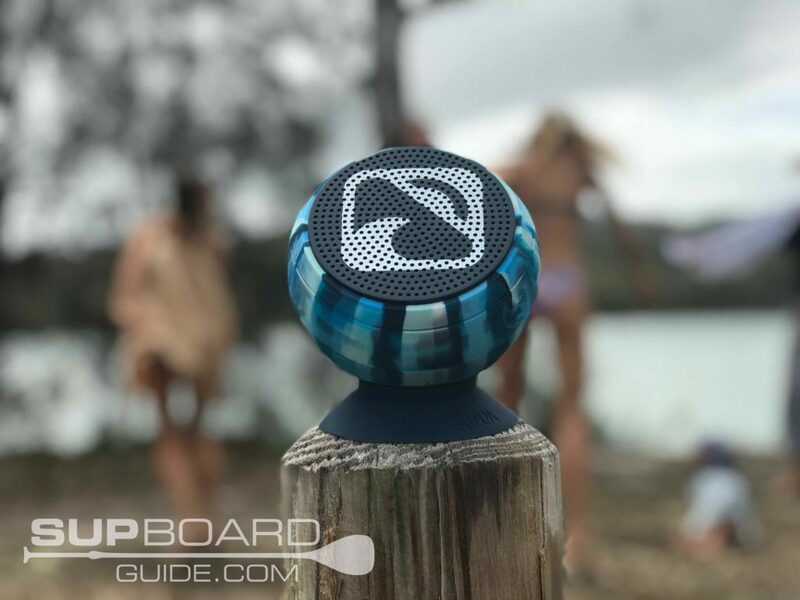 You can attach a variety of fun things including, fishing rod holder, Go Pro or the really cool new waterproof Bluetooth speaker. All of which I go into more detail below. Same as last year, I love the color scheme, it’s simple, bold and even a little suave. The white deck pad is a little annoying to keep clean, but luckily I’m not to phased about that kind of stuff. I can’t decide if I like last years design more or this years! They are both awesome! You get to choose from a teal color or blue, both of which I like too! There are some differences here from the previous year. The side fins are now removable! Yay! It means two things. 1) The board now rolls up tighter and easier 2) It lets you have more control over how you want the board to perform. Being able to switch between a tri-fin setup and a single center fin lets you create some changes in the way the board moves and responds. A tri-fin setup is more stable to turn and has more give in the turn, so it’s great for moving about. While just choosing the one single fin gives you the most amount of glide which helps to track, but to turn, you need more precision. 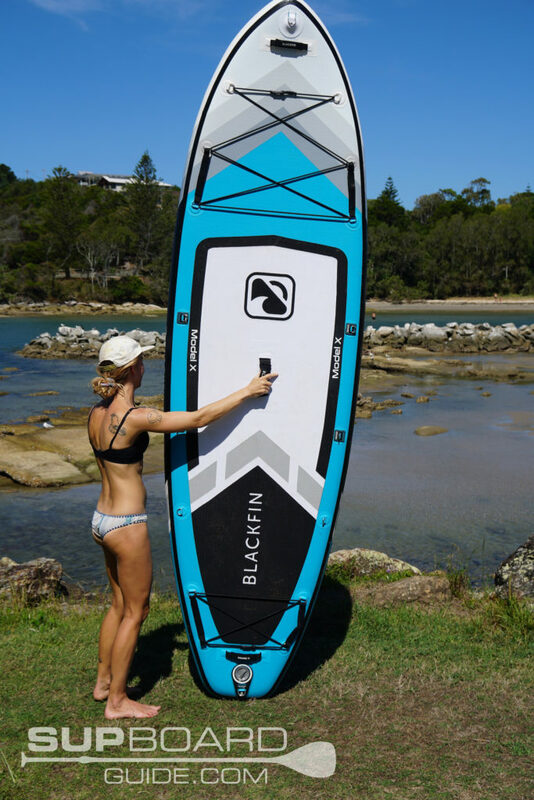 With the new pump, you can pump your Blackfin up in about 5-8 mins, probably closer to 8 as this is a big board. It’s noticeably quicker to inflate using the new pump over the previous dual chamber pump they released last year. Using the three different actions makes it easier to pump so that you can preserve all your energy for the actual paddling! While deflating is as simple as pushing the pin in and twisting it off to let all the air out. You’ll notice with the side fins being removable rolling the board up after being fully deflated is even easier now. One thing that is a little tricky is getting the roll-up happening fluidly. The carbon rails make it a little tougher to roll up, so my advice is to 1) deflate as much as possible before rolling 2) leave the board in the sun for a little while – it helps soften the plastic, making it easier to roll. 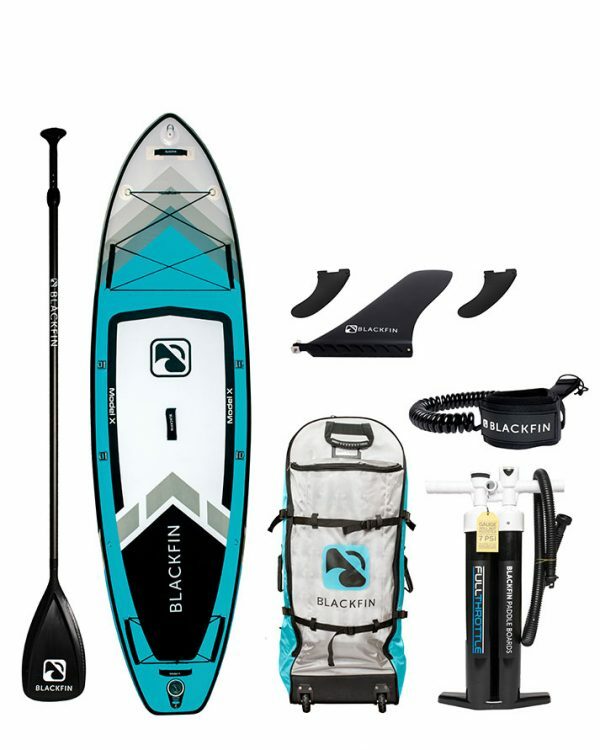 The Blackfin paddle included is adjustable from 72 to 86 inches and breaks down into 3 pieces. What I like most about this paddle is that it’s strong. It doesn’t flex under pressure and is comfortable to use for prolonged periods of time. If you look closely you’ll see little smiley faces on the handle for extra grip, okay so maybe they aren’t smiley faces, but pretty similar! Its carbon shaft makes it a very portable lightweight paddle at 32 oz, but it’s featherweight also means your arms won’t tire as quickly. 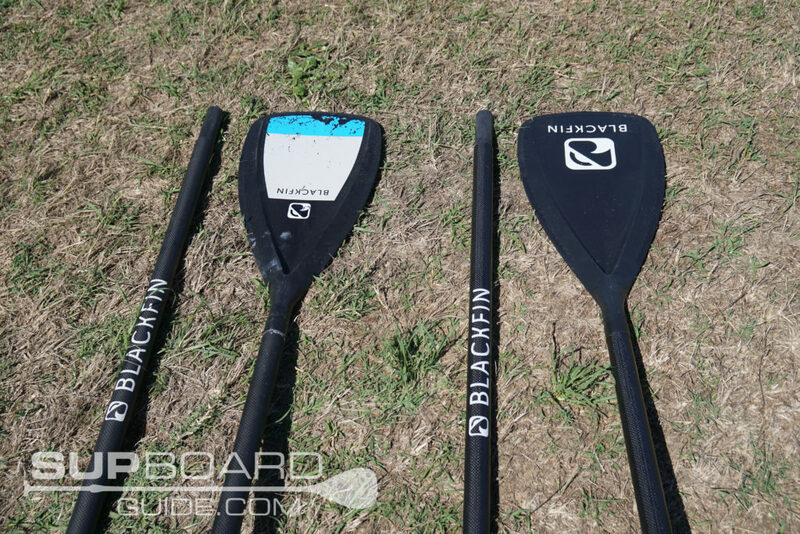 As far as included paddles go, the Blackfins are up there in quality. Wrapping around your ankle comfortably is a coiled leash that attaches to the end of your board. A leash gives you that extra bit of reassurance when you’re out in moving waters and also for children. 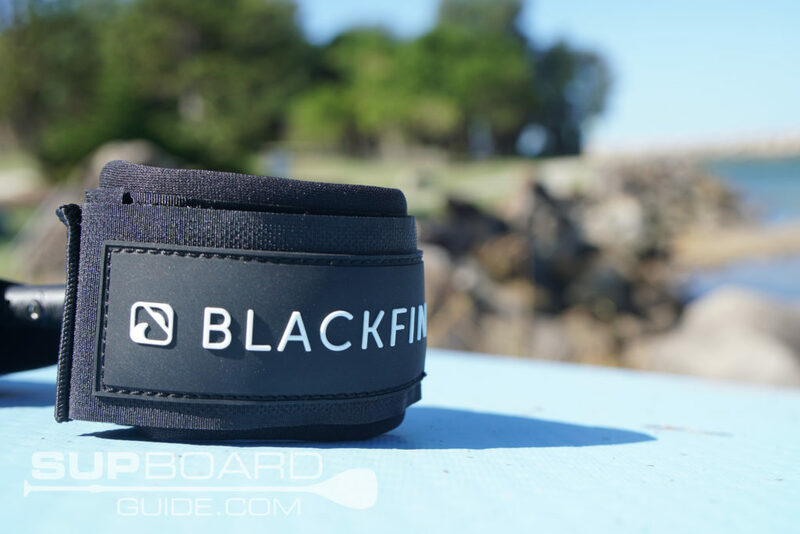 Keeping it nice and tidy, they’ve imprinted the Blackfin logo into the cuff, and at one end you can find a velcro stash spot for your keys. The new full-throttle pump makes life THAT much easier. When I say life, I obviously mean inflating your SUP. Which should be your life. SUP is life. Enough of that though, more about the pump! Well, it’s a triple action, that means you can switch between how much air is being put in the board, therefore, how easy or hard it is to pump. The dual chamber allows you to pump double the amount of air in the same amount of effort from previous single chamber pumps. It’s 25% lighter than the previous dual chamber pump that was released last year too! Rollin’ on through is the new and improved 2019 bag for the Blackfin Model X! 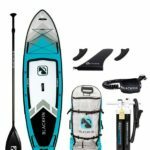 Okay so it’s not exactly different from last year but it is the best-included bag I’ve seen in a SUP package at this price. It’s got strong wheels that are placed on the front so you can’t get your straps caught up in them, making it a perfect traveling companion. 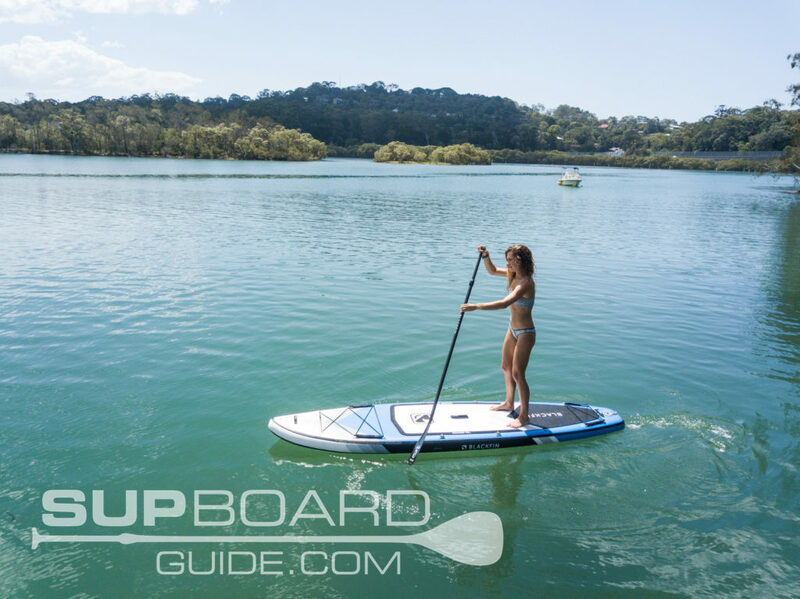 While you can use the straps to carry and even though they are incredibly supportive, a SUP is still a fair bit of weight for some to carry over a distance. Wheels are the go! As so are handles, which there are plenty of all over the bag for easy handling. One cool thing different is that they’ve color-coded the bags to your board. Having both the X and XL, it did get confusing which bag was what until I marked them. This makes it that bit easier to identify what’s in the bag. This cool new extra is something special. You can store up to 4GB of music/podcasts inside the speaker itself so no need to even bring the phone if you don’t want to! 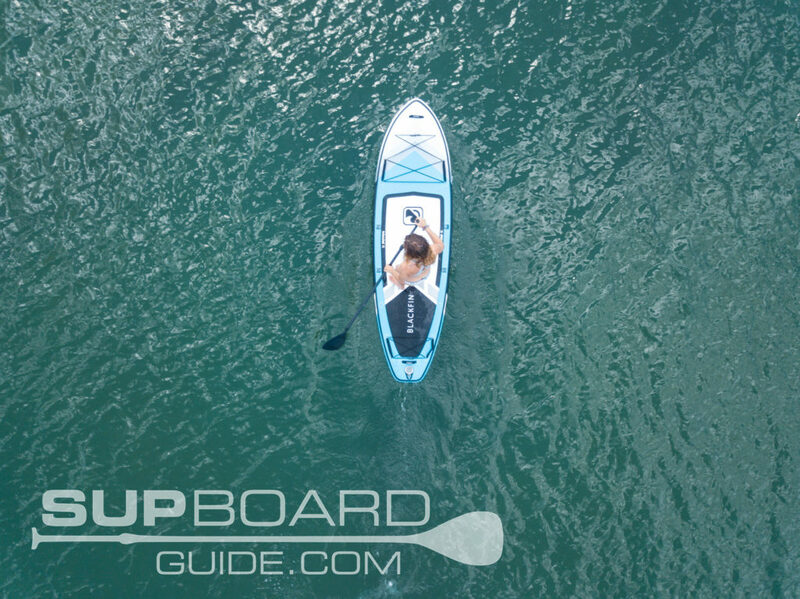 If you aren’t paddling too far from your phone and are connected via Bluetooth you can even take calls thanks to the mic and Caller ID function. 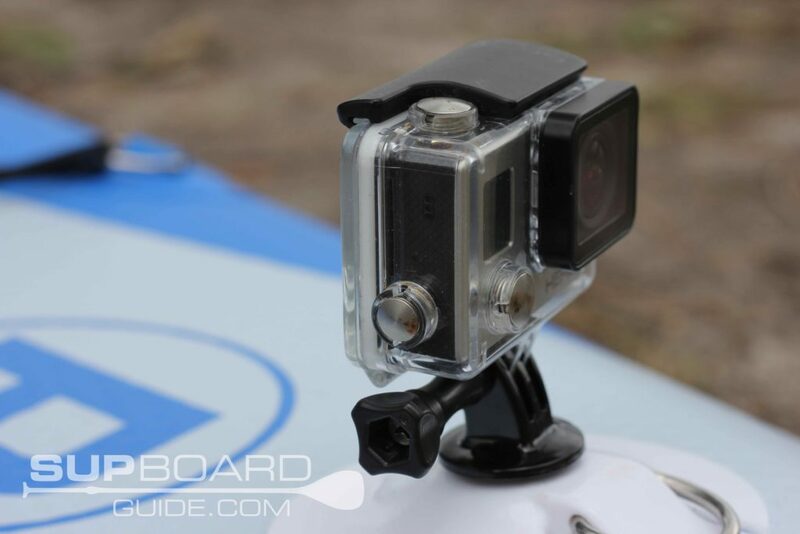 Attachments are either by suction caps or you can also screw directly into the action mount. Being entirely waterproof and even continuously playing music when submerged, you have not to worry about this speaker going overboard. In the occasion it does, do not fret, it even floats! What a piece! If you are in the market for something stable, fun, and that’s great value, maybe you should be on a dating app not here reading this! But all bad jokes aside, from the moment these were released I’ve been recommending them on to the multitudes looking for a family board or those needing the extra weight capacity. If you will be on your own more than others, the Model X should be your choice while if you want the extra weight capacity/stability more then you should be looking at the XL. There isn’t quite another board like the Blackfins, combine their unique makeup of carbon rails and now the new composite PVC and competitive accessories, the value is like no other in this price range (I mean that, it’s not a sales pitch). To keep you all safe and snug in your purchase, there’s also a 2-year warranty and 30-day money back guarantee.